I had to keep from shouting as I quickly replied, “yes!” Yes, you can bring your kids to worship! A few minutes later, her toddler son joined mine in block-building (and destroying). 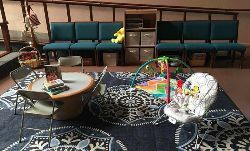 This is just one example of how the Pray-ground has changed the worship experience for young families at Glen Cary. A Pray-ground is an intentional space within the sanctuary specifically for young children (e.g. 0-3 years old) to engage in worship. The space contains soft-toys, foam blocks (the favorite), books, crafts, and a small table with chairs to allow young children to do what they do best—play. Meanwhile, they are together with the rest of their family, included in the faith community, and invited to participate in worship. Similar models have been utilized across denominations in churches all over the world. This project is part of a larger effort within children, youth, and family ministry at my context site. According to a recent survey, parents with young children have a difficult time attending and participating in worship. How do we do better ministry with and for these young families? The Pray-ground was one of the responses to this question. Creating spaces at church that appeal to young children is an act of outreach and hospitality, toward kids and parents alike. After the Pray-ground’s initial success, a similar space was added to the narthex for families to enjoy over coffee hour—the kids love it! Hospitable spaces are not merely practical; they also make a theological statement. As a community, we have entered into the baptismal covenant of each child and have promised to support them in their lives of faith. We believe that all members of the body of Christ are important and make valuable contributions—this includes young children. Rather than exclude them or stifle their gifts, we want to make space for them to be their authentic selves: kids who can worship the living God by playing, dancing, singing, moving around, creating art, and reading stories. Further, participation in worship is important for a child’s faith development. Studies have shown that children who are not involved in worship during childhood are less likely to participate as adults1. This project has encountered some challenges. Many people at my site are more traditional, and feel more comfortable with their kids sitting in the pews. Others continue to wonder if kids belong in worship in the first place, and are more accustomed to age separation during church activities. Kids in worship are often seen as distracting or embarrassing, rather than an opportunity for relationship-building or outreach. Ultimately, like so many other ELCA congregations, our church is aging; young families are the minority at Glen Cary. Speaking from personal experience, I understand the sentiment expressed by many families on our survey: bringing children to worship is difficult. However, the rewards are great. I started to realize the difference when I came into church one day and my son immediately started walking toward the sanctuary—he knew that he belonged there. Seeing my own child involved in worship and welcomed into the community of faith has been one of the great joys of my internship—and I continue to hope for and promote the same opportunities for other young families.